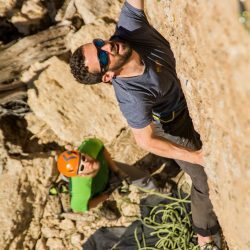 As a young climber, I would frequently talk to my parents about climbing. They were genuinely interested, and my father even did a few climbs with me early on. They wanted to know enough to be sure I was safe and careful, but didn’t need to know more. As I improved, I started to talk route beta and movement with them and I usually missed the blank stares when it came to jargon they didn’t understand. They had no idea what a gaston was or a smear or a flash pump…and didn’t really care to know. It didn’t stop me from sharing, though. 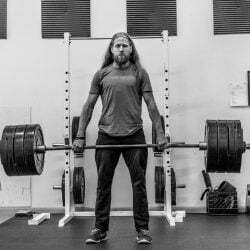 Years on, I started teaching training techniques to athletes and although many of them understood the language of fitness, many did not. It wasn’t until the blank stares I’d remembered from my youth registered that I realized that we weren’t speaking the same language. Over the past few years, a large portion of the questions I get about my books have to do with simple notation. The error is mine – assuming someone understands how to read a workout or a plan is the worst first mistake. If they can’t even read the thing, how can we expect them to do it? This notation is important. It is something that is easy to understand once you have the hang of it, and it opens up a valuable communication channel for athletes and coaches once both are on the same page. What follows are the most common terms, phrases, and notations you’ll see in our training plans and articles. These terms are used consistently in our work and although you may see some variation from other coaches or cultures, with a good grasp of the basics you should be able to figure things out soon enough. This might seem obvious, but an exercise is a specific pattern of movements designed to overload the athlete in a way that improves her function either as a human or as an athlete. 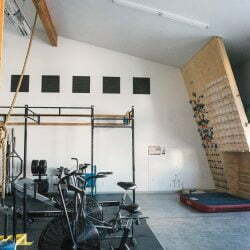 Exercises are grouped together to form training sessions. Examples of exercises might be a squat, an edge hang, or a campus ladder. Sessions are groups of exercises. Also called workouts, sessions are primarily aimed at overloading a specific kind of fitness such as strength or endurance. Sessions are ideally grouped into a series that would then form a Training Plan, which is usually 4-6 weeks in length. These are groups of sessions aimed at eliciting a specific response from an athlete. This is a fundamental building block of progression, but is sometimes ignored, even by very good athletes. A training plan is generally 4-6 weeks in length and will focus on improving only one or two fitness qualities at a time. Programs are groups of training plans. Most programs are 6 months to 5 years in length, and are build around long-term performance goals. Programs are normally quite detailed in the near-future and become less-so the further we look down the road. These are individual cycles of exercises within a session. Most exercises are repeated several times in a session. For example, you might do 3 sets of squats and 3 sets of pull-ups in a given session. This means you would visit each exercise 3 different times in one session. Sets are divided into reps, which are the individual performances of the exercise. Reps are the number of times you perform an exercise in a given set. A session might call for 3 sets of 10 repetitions of a pull-up. This would mean you’ll perform 10 pull-ups, then rest until recovered enough to do pull-ups again, do 10 more, rest, and then do 10 more. Static exercises such as planks or edge hangs on a board are usually noted in seconds, with each second held counting as one “rep.” If you are training limbs individually such as in a lunge or single-arm hang, reps are generally noted in terms of # + #, such as 8+8…which means 8 reps per limb. These are groups of several different exercises done in sequence. In a circuit, you perform on set of an exercise before moving on to the next exercise. Once you have completed one set of ach exercise, you would start the circuit again. Sessions that feature circuits will usually call for 3-8 circuits of 5-10 exercises. These are typically more endurance/conditioning-based sessions. A “number x number” notation is indicative of sets x reps. If an exercise calls for 3×5 you should plan on doing three sets of five reps. Recall that an exercise performed for reps on each side is indicated by the plus (+) sign, so you might see 3 x 8+8 to indicate 3 sets of 8 reps on each side. Reps might also be noted on a set-by-set basis. In this case, you might see 5-3-2 in your session plan, indicating that the first set should be done for 5 reps, the second for 3, and the last for 2. This is usually followed by an explanation of loading parameters. RM stands for “repetition maximum.” This value is useful in determining the intensity of loading in weight training. For example, your program might call for 3 sets of 3 at 85% of 1RM. In order to effectively use this information, you will need to calculate your 1-rep max for a given movement, then take the percentages. We also use variations on this idea. %MVIC, or the percentage of maximum voluntary isometric contraction, is used in calculating holds of static positions. “Sec max” is also used. This number, such as “10 sec max” is used in prescribing static holds, usually on the hangboard. This notation is used to describe timed intervals. Simply put, the first number is the work duration and the second is the rest duration. So, then, 6 x 7:3 would mean 6 sets of 7 seconds work followed by 3 seconds rest. If the rest is not passive sitting on the floor or walking around the gym rest, it is usually noted. For example, in a Rhythm Interval, you have an active rest. The sessions are usually noted as follows: 4 x 30:30, but in the session’s description you are instructed to move up and down the board for 30 seconds then rest on a big jug for 30 seconds. This is an indication of how many times you would complete a circuit or group of exercises. To use the Rhythm Interval example, you may be instructed to do 3 rounds of 4 x 30:30 with 4 minutes between. With this information, it is easy to figure out just how long your training should take, in the example above, you’d do 4 minutes of intervals in set 1, rest 4 minutes, do 4 minutes of intervals in set 2, rest 4 minutes, and do a final set of 4 minutes…20 minutes total. The era of bodybuilding ushered in the idea of training to absolute failure. This was relatively safe to do as the exercises were highly isolated – curls, calf raises, leg extensions and the like. You keep trying to move a load with worse and worse form in search of the elusive “pump.” In the early 2000s high-intensity timed circuits became popular and with the advent of Crossfit so did including compound lifts in these circuits. Training to failure was encouraged and many injuries and serious medical issues were the result. We encourage athletes who are trying to develop strength or power or skills to train only to the point of technical failure, the point at which you can no longer do the movement with the same quality or speed as you could at the beginning of the set. There is little value in going past this point except in the pursuit of hypertrophy. Since hypertrophy is rarely our goal, we rarely go there. I plan to keep updating this post as questions arise. If you have any questions at all about notation please post a comment below and I’ll add this information to the text.